I spent some time today making up these Pokemon pajama pants for Jake. As soon as I found this remnant at JoAnn’s, I knew it would be perfect for him, if there was only enough! He and his much-older sister love to play the Pokemon game on her phone, and they watch tv shows about Pokemon as well. It’s kind of their special thing, and so he loves the characters. This fabric is normally quite expensive per yard, but the bolt was on sale, and then the remnant price was 1/2 the sale price. It ended up being a good price after all those reductions, so I took a chance and bought it. This piece was either a yard, or within an inch or two of being a yard. I used it down to the last inch, but it was the length I needed to make him a pair of pants. They are actually pretty big on him, so should last a while. The fabric is very fuzzy and soft and he loves how cuddly it is. It was a bit of a pain to sew, as it wanted to squiggle out from under the needle, but thankfully, I was able to get it to behave for the most part. I think the fabric was probably intended for a blanket, but this worked, too. These p.j. pants were part of his birthday present, but I waited until he was over here so I could measure the elastic around his waist, and make sure the length was good. That all happened today, and we were both pleased with the result. It took a bit for me to convince him it was pajamas and he couldn’t wear the pants all day. I’m not sure why I bothered. When we went to the store, there was a big boy wearing a full zip-up Pokemon sleeper…….hmmmmm. I think I’ll still let p.j.’s stay home for nighttime at my house:). I guess I’m a little old-fashioned! There were just two skinny scraps left. So, 2 kitties got scarves. 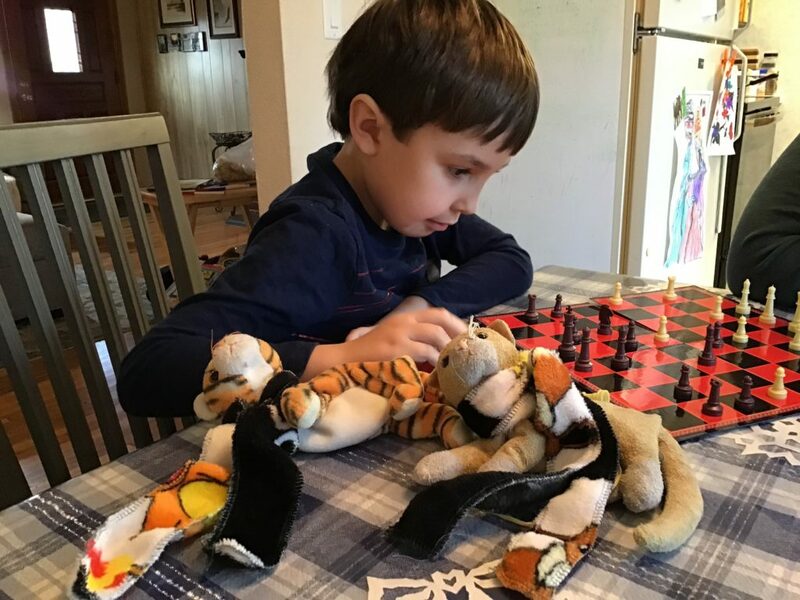 They watched, along with the kitty who didn’t get a scarf, as Patsy tried to teach Jake how to play chess. 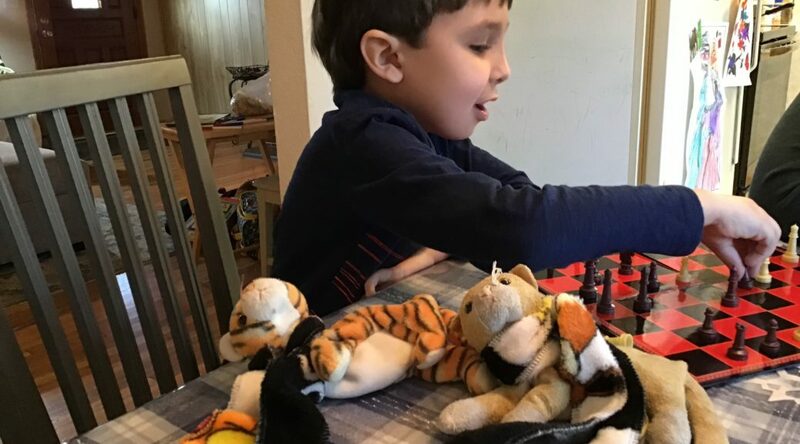 I’m not sure he’s got chess down, yet, but he seems to enjoy games quite a bit right now and is happy to have someone who will play with him. And, I was glad to get another project checked off my list! 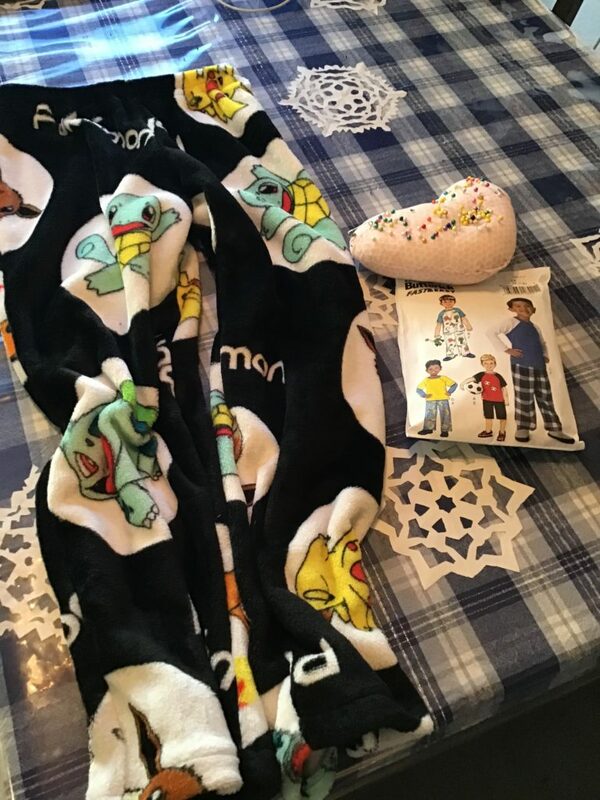 I was very happy to complete a fun sewing project yesterday. I had a bit of trouble gathering the needed notions, though. When I got this fabric 1/2 price last Saturday, I didn’t buy thread. Why would I buy thread? I have a small bin absolutely full of spools of thread from projects in the past. But, not this color except for a teeny, tiny bit on a small spool. Or anything else that was close. I used the little bit and I sent poor Rob off to JoAnn’s on Monday, but he was unable to get any. They were still decimated from Black Friday weekend, and most of the blue thread was gone. The clerks were super busy, and couldn’t help, and since Rob is color blind…..he didn’t feel confident to choose another color instead of the exact color I sent him to get. (He took a picture of the old spool to get the number from it.). I got some at Walmart the next day. Whew. Then, I went to my bin of zippers to get one–after all, with a small bin of zippers, I never need to buy one, right? Wrong! There were no blue ones. On Tuesday night, I got my zipper. I bought an extra blue one for the bin:). In the meanwhile, between running around for these bits and pieces, I sewed the white parts, and what I could with the small amount of thread I had on that little spool. Yesterday, with the proper notions, I finished the little dress. 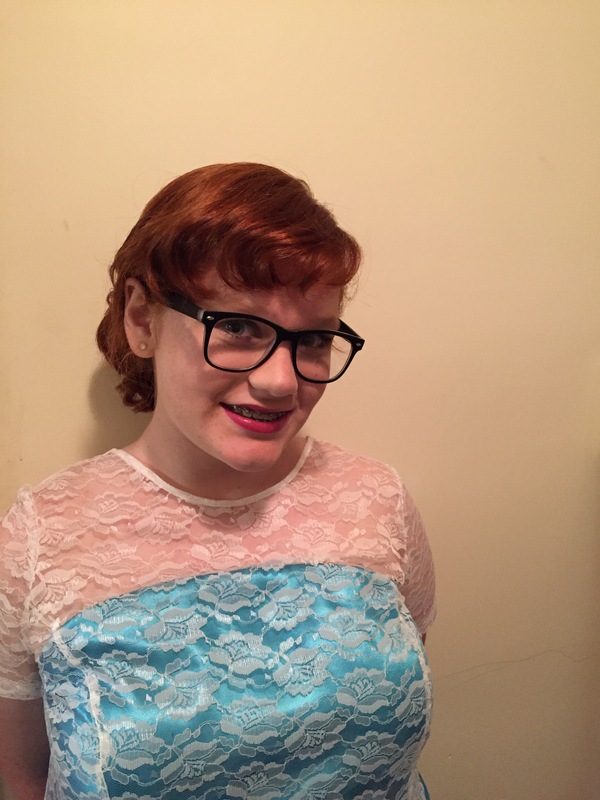 In anticipation of the Homecoming dance, I have been working hard, making Patsy a dress to wear. It was pretty thought-provoking, as there were lots of alterations to be done. I finished last week, much to my delight, after several late nights/early morning sessions. 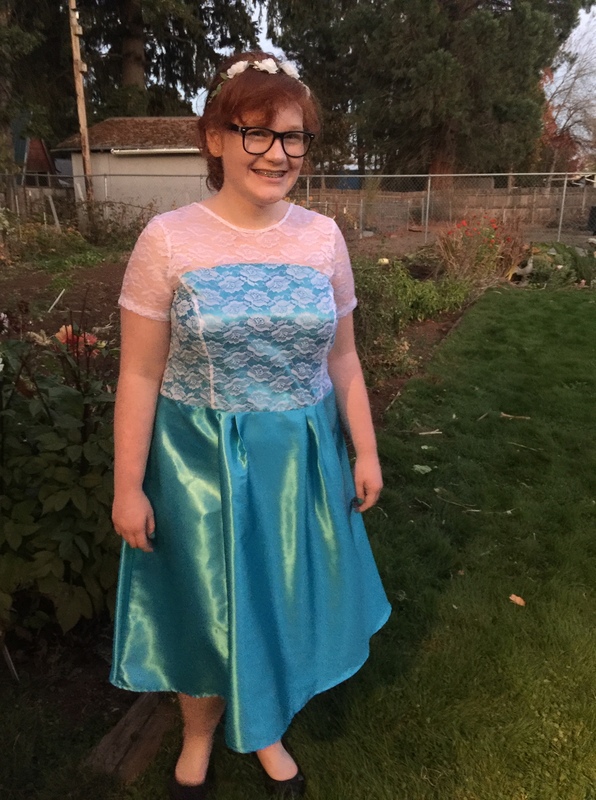 Patsy got to wear her dress last night to the Homecoming Dance at her school. I got some great pictures of her, and so did Rob. 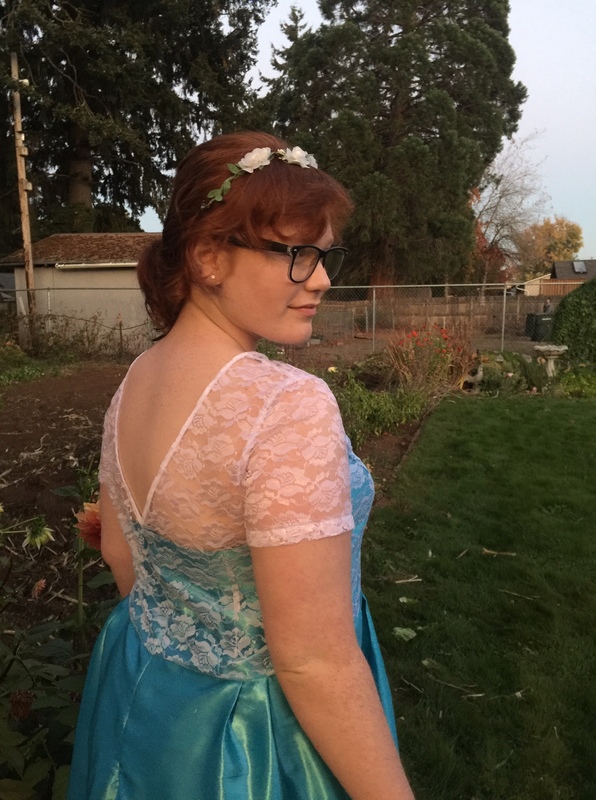 I know several of you have been asking to see photos of the dress, and I am happy to say I now have some. 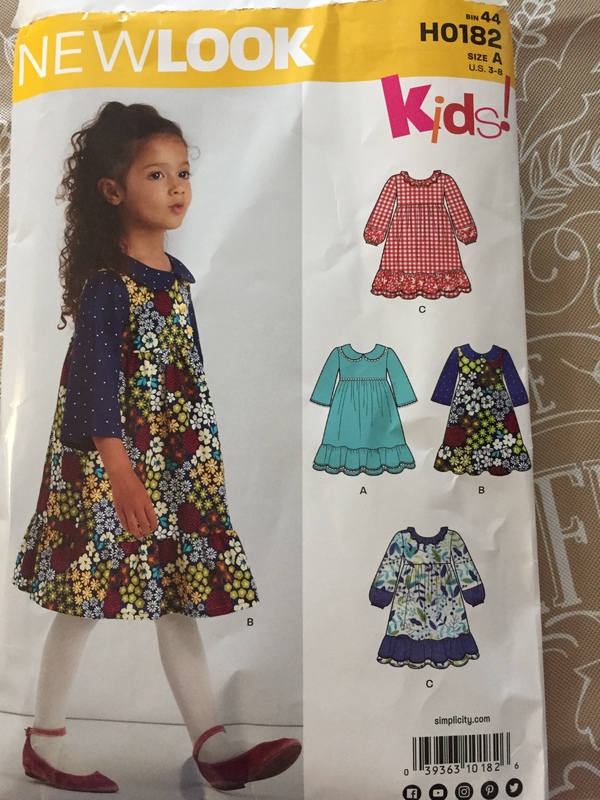 I started with Simplicity 1415. I did not have the correct size and there were no pattern sales for $1.99, etc. so I altered the pattern I did have. I purchased some fabric at JoAnn’s, and it was all on sale. First, I taped the bodice pieces onto some butcher paper. Then, I did a lot of measurements to both the girl and the pattern, drew the new lines where I wanted them, and then cut out a bodice from some muslin I had in the shop. I basted this together, made more adjustments for correct fit, and then moved on to cutting out the lace overlay. As you can see, the lace back dips down to meet the under bodice piece (blue). To make that match with all the alterations was a bit difficult, but I just kept trying it on her, and making adjustments. When the lace overlay was fitted correctly, I decided to make a binding from scraps of the lace fabric. It looked much better than the bias tape that was called for. The bias tape would have been way too bulky and would have shown through the sheer fabric. I just cut scraps on the bias, sewed them together, ironed them in half, then sewed the binding on. I then made the underlay and put the facing on. This also needed many try-ons to make it fit and to make the seams of the lace on top line up with the seams of the blue underneath. I also raised the neckline a bit on the blue in front and down a bit in the back to match the lace. 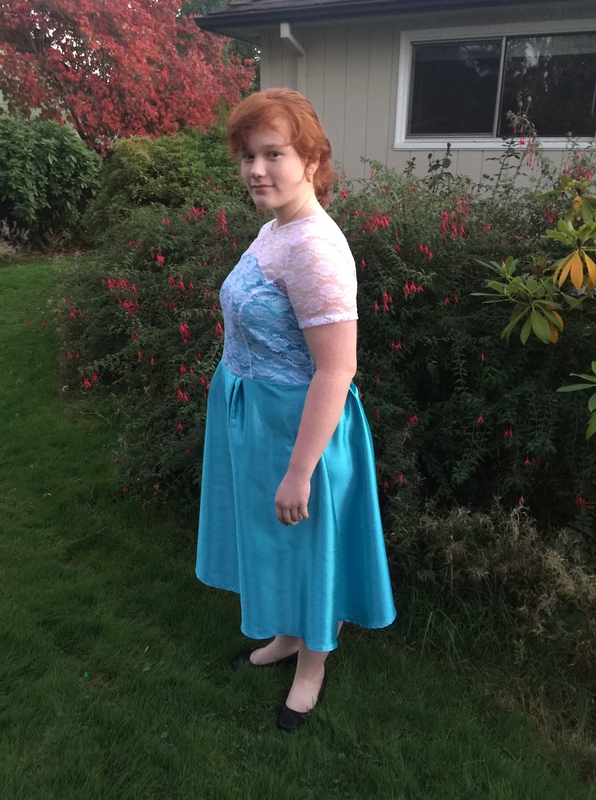 I sewed the skirt on, adjusting the pleats so that the skirt would fit to the bodice. I also needed to adjust the length of the bodice, taking off a lot of excess fabric in the back, and none in the front….but it finally sat at the waistline as is should. Then, I got to put in my first ever invisible zipper. I have to admit, I put it in nicely, got the waist seams to line up after a couple of tries, but ended up having trouble at the very bottom. So, I just finished the very bottom by hand, and you cannot tell from the outside at all. 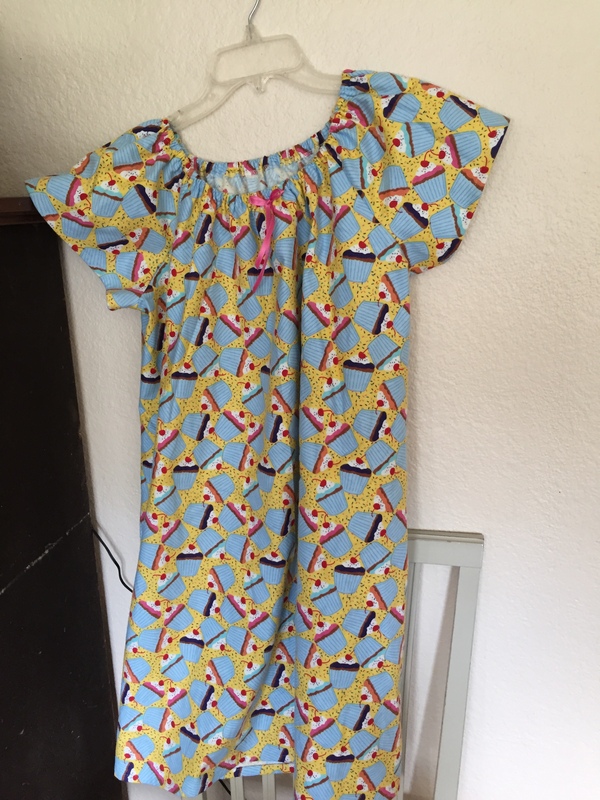 I didn’t want to rip any more than I had to, as the dress fabric was so delicate, and I had tried a couple of times before I just changed my method. To sum the project up: Cost: Around $25. Times tried on: At least 20. She was very patient. Patsy was very happy with the dress, which makes it all worth it. We had spent an evening shopping for dresses and could not find one that fit her, we liked, and was affordable. She will be able to wear this dress again for Christmas Eve church. Our family always dresses up for that service, a tradition we started years and years ago. 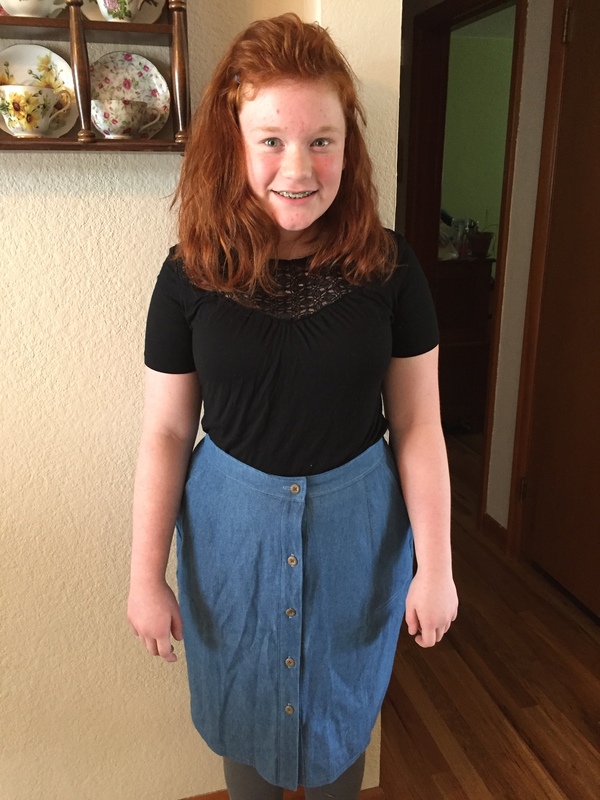 So, while people come in every conceivable outfit to that service, my girls usually wear fancy dresses. It’s kind of fun for them to have an occasion to wear the fancy ones, I think. We will try to find a shawl for that occasion, as it will likely be very cold. I like to sew, and have not make a big project for quite some time. I am glad to be done, though, as it was very hard for me to find enough mental energy for all that altering–I have to really think to change a pattern as much as I did. It also took quite a bit of time during an already-busy canning season. I’m hoping to find a little more time to sew her a few more things this fall. I have fabric in the shop, and she could use some more skirts. Thankfully, they are easier than this dress was! I decided to use my days off for sewing. It’s quite a process around here, as everything has to be taken out of the garage, and all parts and pieces have to be found. So, I took over the table, told people to eat elsewhere, and got busy. I got started on Saturday afternoon. I finished up this skirt for Patsy I had started quite some time ago. Thank goodness it still fits. I moved on to a pair of pajama pants for Ja’Ana. This was a piece of fabric I’ve had for years, and I went out to the shop and dug it out since I knew it would be perfect. I spent quite a bit of time Sunday afternoon cutting it out so the plaid would match. I haven’t matched plaids for a long time, so it took me a long time. Success comes from careful cutting with plaids. 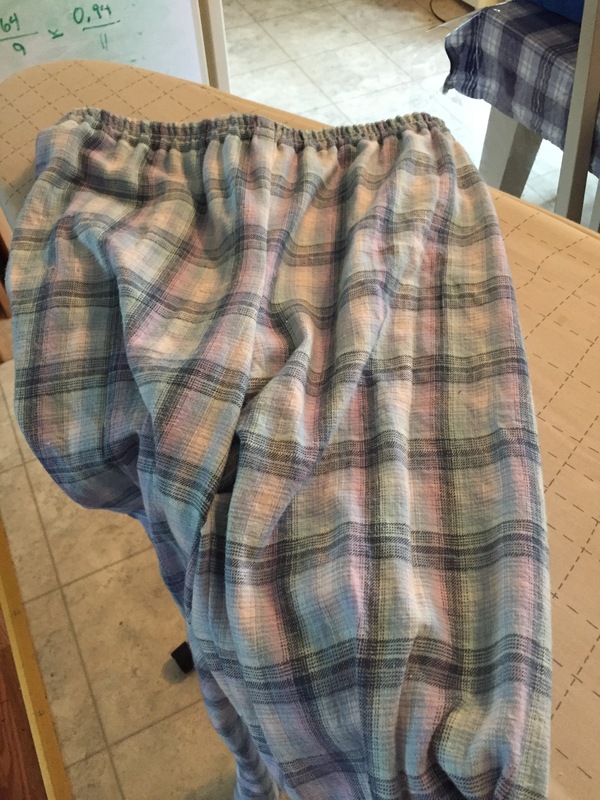 I sewed the pants on Monday, and was delighted with how well the plaids matched. It actually took around the same amount of time to cut them out as it did to sew them! 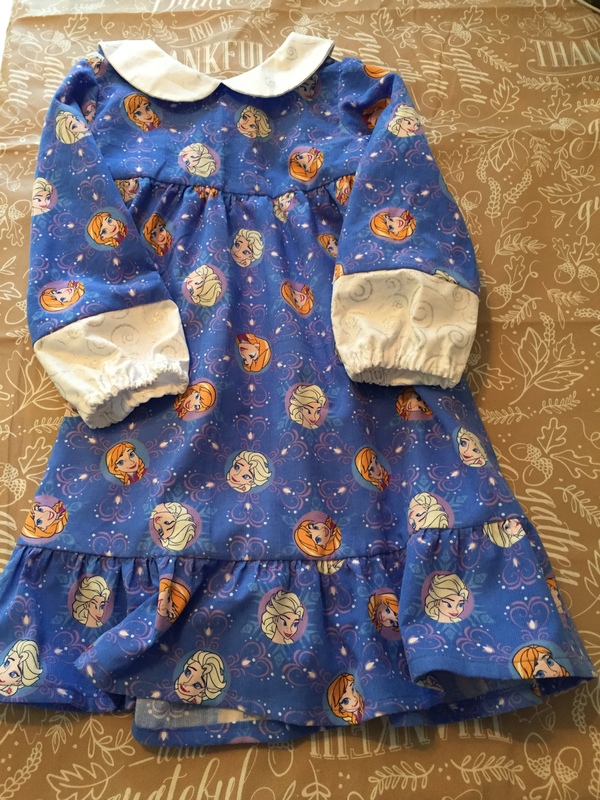 A nightie for Patsy was the next project. It went together quickly. I got another skirt cut out as well, and even got started, but I’ll show that one when I get it done. It will be a while before I get another chance to sew. You may notice that I chose projects that were very simple and quick. I feel great about getting them done, and using some fabric I’ve had for a while. The girls will really benefit from some new nightwear. I’m also very happy to have finished the skirt, at long last. I cleaned up the entire mess, but hopefully put the machines and all parts and pieces in handy places so I can pick them up easily if I do get a chance to sew again before long. We did a few other fun things on our days off, as well, so I feel pretty good about this weekend. Good thing….it all starts up as usual tomorrow, bright and early!